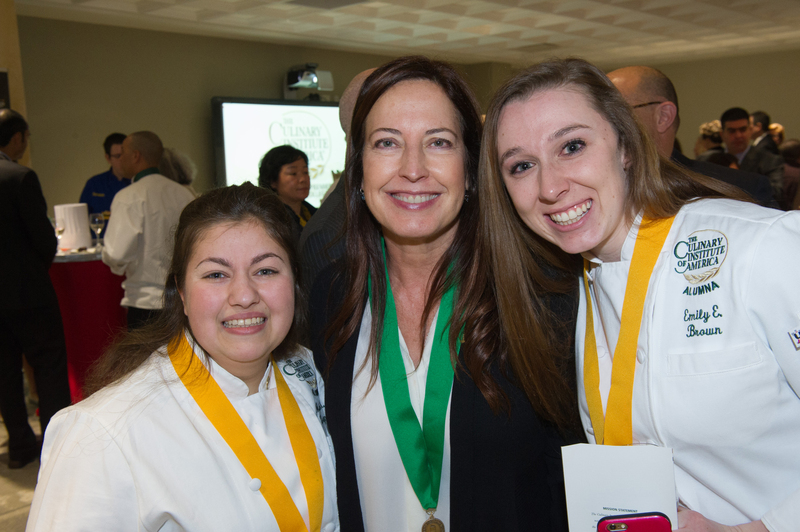 Hyde Park, NY – Debra Ponzek, chef/owner of Aux Délices and Aux Délices Events in Fairfield County, CT, challenged graduates of The Culinary Institute of America to be not only skilled professionals, but also good colleagues and co-workers. Chef Ponzek delivered the commencement address at the CIA’s New York campus on March 27. After graduating from the CIA in 1984, Chef Ponzek worked for Drew Nieporent at Montrachet, quickly rising from sous chef to executive chef. During her seven years running the restaurant’s kitchen, Montrachet earned a trio of three-star reviews from The New York Times. In 1994, she moved to Connecticut to open the first Aux Délices in Greenwich. There are now three additional locations of the gourmet prepared food shop and café, plus a catering and event planning division. Chef Ponzek’s career accolades include being honored as one of America’s Best New Chefs by Food & Wine magazine in 1989 and winning the James Beard Foundation Award for Rising Star Chef in 1992. Founded in 1946, The Culinary Institute of America is an independent, not-for-profit college offering associate degrees in culinary arts and baking and pastry arts and bachelor's degree majors in management, culinary science, and applied food studies, as well as certificates in culinary arts and wine and beverage studies. As the world's premier culinary college, the CIA provides thought leadership in the areas of health & wellness, sustainability, and world cuisines & cultures through research and conferences. The CIA has a network of 48,000 alumni that includes industry leaders such as Grant Achatz, Anthony Bourdain, Roy Choi, Cat Cora, Dan Coudreaut, Steve Ells, Charlie Palmer, and Roy Yamaguchi. The CIA also offers courses for professionals and enthusiasts, as well as consulting services in support of innovation for the foodservice and hospitality industry. The college has campuses in New York, California, Texas, and Singapore.